This entry was posted on Sunday, August 10th, 2008 at 3:05 am	and is filed under Uncategorized. You can follow any comments to this entry through the RSS 2.0 feed. You can leave a comment, or trackback from your own site. Very impressive Osunick! I know my Genie garage door opener could handle that too! 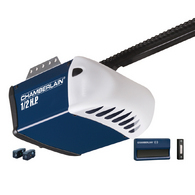 the problem with cheap garage door openers is that they are sold with a 3 piece rail. The 3 piece rail has a tendency to warp or break due to the stress points. I always recommend to my customers liftmaster garage door opener motors with the one piece rail. They get the full warranty and I have yet to replace a rail, only head units due to lightning strikes and such. Your current setup defeats the inbuilt safety systems of the openers. You’re opening your doors with a closing motion (if I’m seeing this correctly), which means if the door hits something opening, it will close back, and if you’ve installed the safety sensors, if someone crosses the beam, the door will close instead of opening. You have a very good idea, but I would have mounted the openers in the opposite directions, putting the motor units to the middle. 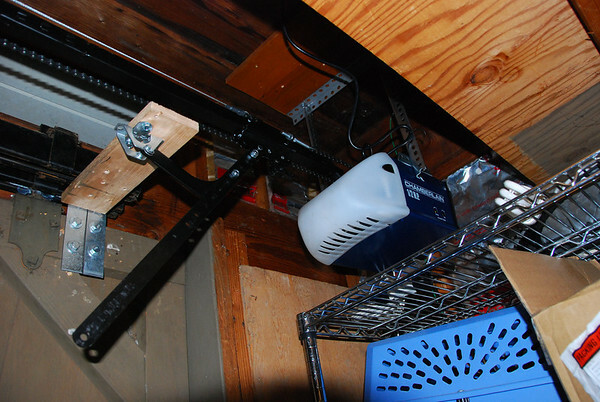 There’s a beam in the center of my garage, so mounting the units in the middle isn’t feasible without cutting the beam. The safety sensors are actually bypassed, so the only thing I have preventing disaster on the garage are the force limiters which I believe work on both opening and closing. So I agree with you but mounting the openers in the center wasn’t feasible, particularly if I wanted to have both doors. Heh, do all Eichler owners drive Audis? Thanks to your ideas and the detail here, I have automated both my garage doors. I should have followed your instructions on the brackets. I will have to redo the outer door to it does not interfere with the 2nd door. Also since I have the beams going the other way ( parallel to the garage opening) I was able to install the openers in the center and have working safety sensors. Once again than you for a very informative essay. Thanks, I also own an Eichler down in SoCal. I installed one garage door, which is good enough for me. Your website was invaluable to us installing the opener.